Northwest of Los Angeles, the Pacific coastline alternates between lengthy built-up areas and shorter natural stretches, the first in and around Port Mugu State Park within Santa Monica Mountains National Recreation Area, and then an undesignated few miles on the west side of Oxnard. For 30 miles beyond the coast is fully developed, centered on Santa Barbara, but the west edge of the city marks the start of more scenic, empty terrain, where towns are the exception rather than the rule. US 101 continues, staying close to the Pacific, along a narrow strip of flat land beneath the steep Santa Ynez Mountains, carpeted with crisp green vegetation and many spring wildflowers. Views out to sea extend to the Channel Islands, 30 miles south. The highway still has four lanes but is noticeably less busy than through Santa Barbara and cities to the east. There are two (free) state beaches, El Capitan and Refugio, neither scenically very interesting, since there are no major rock formations or offshore islands, just a long, narrow strip of sand beneath low, unchanging cliffs. The highway turns inland just after the tiny village of Gaviota and runs through quite an impressive canyon, at the center of Gaviota State Park, a varied preserve containing about 2 miles of coastline, now a little more photogenic, with higher cliffs and some rocky terraces, plus several square miles of the adjoining, steep, bushy hills. 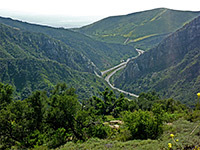 These are crossed by half a dozen trails, of which by far the most popular is the climb to 2,458 foot Gaviota Peak. The summit lies outside the state park, in the neighboring Los Padres National Forest, but the start of the route is within the park. Other facilities are a campground, store, two highway rest areas and several other parking spots. 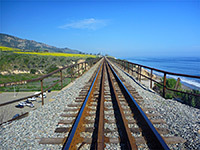 One other component of the park is a single track railway, which runs all along this part of the coast, very close to the ocean, and bridges the mouth of Gaviota Canyon on a high trestle, adding a contrasting, angular element to the otherwise natural scenery. 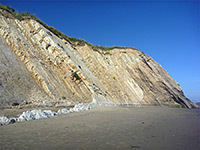 The main visitor area in Gaviota State Park is at the south end of Gaviota Canyon (Canada de la Gaviota), reached by a half mile side road that forks off just after US 101 veers abruptly to the north. A relatively high fee of $10 is charged for parking, avoidable if leaving vehicles around the junction and continuing on foot. The road passes the campground and ends at the parking lot, extending to the foundations of the hundred year-old trestle bridge, beyond which lies the main beach - about 500 feet across, bordered by a pier on the west side and the shallow waters of Gaviota Creek to the east. Past here, a narrower beach extends for many miles. The campground is not especially scenic, and the sites are rather close to each other but this is the only place for overnight stays hereabouts; all the land surrounding the park is privately owned so there are no places for free primitive camping; the nearest location for this is in Los Padres National Forest, about 30 miles northeast. The coast is more interesting further west, though a protruding headland prevents walking at water level, except at the lowest tides. 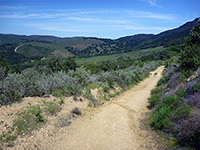 Instead, this area can be reached by climbing to the top of the bluffs - either along Hollister Ranch Road which branches off just before the campground, or via an unofficial trail at the edge of the beach, up to and across the railway - then by walking west a little way and following a faint path back down. The railway is in regular use, though trains are infrequent. 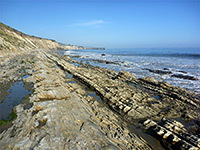 This next section of the coast is characterized by steeply sloping cliffs formed of thin-layered, sedimentary strata, eroded terraces at sea level, plus a few small offshore rocks. The side road has a few parking areas and one trailhead but it soon enters private land, at the start of a long, inaccessible stretch of the California coastline, most part of Vandenberg Air Force Base. After following close to the Pacific coast for most of the 120 miles from Los Angeles, US 101 turns inland at the state park, climbing through Gaviota Canyon, where the two carriageways divide for one mile, the northbound lane enclosed in a short tunnel at Gaviota Pass. Two rest areas allow for an appreciation of the scenery, and not far beyond are two other parking areas, for trails into the park backcountry. Both are close to the Hwy 1 intersection; the main one is on the east side, trailhead for the hike to Gaviota Peak and Las Cruces Hot Spring. 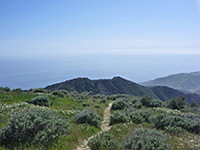 The lesser used trailhead is to the west of US 101, where several paths climb to summits overlooking Gaviota Canyon, and one leads all the way back to the beach.